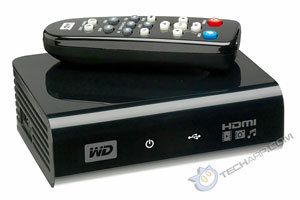 December 10, 2008 – WD® (NYSE: WDC), the world’s leader in external storage solutions, today introduced a simple way for consumers to play their stored digital content on their HDTV in Full-HD 1080p resolution. The WD TV™ Media Player connects to a user’s TV or home theater and plays digital movies, music and photos from WD’s My Passport™ portable drive or other USB mass storage device. The WD TV Media Player is available now at select retailers. According to research firm IDC, nearly 334 million GB of photos and more than 3.1 billion GB of video will be stored on consumer desktop and laptop computers in 2008. The research firm expects that to increase to 400 million GB and 5.8 billion GB, respectively, by 2010.
access their high-definition content on the biggest screen in the home. can build large collections on multiple drives, all playable by WD TV. their media by media type in one menu regardless of its location in folders or drives. To find out more about the WD TV, continue reading our review!  Protected premium content such as movie and music downloads from iTunes® Store, Cinema Now, Movielink®, Amazon Unbox™, and Vongo®.